Jennifer is a full-time salsa instructor, choreographer and event organizer. She is co-owner of Steps Dance Studio & co-founder of the Women’s Salsa Retreat. As a trained adjudicator, Jennifer has judged competitions in Puerto Rico, Ecuador, New York, Los Angeles, Las Vegas, Orlando, Miami, Detroit, Ottawa, Montreal and Toronto. She has also represented Canada on the judging panel for the World Salsa Championships televised on ESPN. She is on the judging panel for the prestigious Global Salsa Championships at the World Salsa Summit. Jennifer was also the first instructor in Canada to be certified to teach Latin Hustle by the IHDA. Jennifer is the founder and organizer of the annual Canada Salsa & Bachata Congress, an international salsa festival that takes place in Toronto every October. This 4-day extravaganza, now in its seventeenth year, is the largest salsa event in Canada and features nightly performances by over 80 dance companies from all over the world and daily salsa workshops given by world-renowned instructors. The Canadian Salsa Championships, part of the Canada Salsa & Bachata Congress weekend, is the largest and most widely recognized Salsa & Bachata competition in Canada. Jennifer has also managed an organization which teaches Latin Dance to elementary and high school students. This program was born with the mission to build confidence, self-esteem and cultural awareness in children and teens through Latin Dance in the school curriculum. Jennifer has been involved in dance and the performing arts her entire life and has extensive training in gymnastics, ballet, flamenco, Argentine tango and, of course, salsa. To keep progressive, she continues to travel extensively to learn from the world’s best dancers and instructors, and has attended close to 100 salsa congresses in Puerto Rico, Los Angeles, New York, Colombia, Ecuador, Miami, Zurich, Amsterdam, Washington, Boston, Detroit, Orlando, Vancouver, Ottawa and Montreal. Jennifer has also taught at salsa workshops in Puerto Rico, Holland, Ecuador, Washington, Los Angeles, Miami, Orlando, Detroit, Montreal and Ottawa. She, along with all of the instructors at Steps Dance Studio, received her Salsa Certification by Mr. Tito Ortos of Puerto Rico. 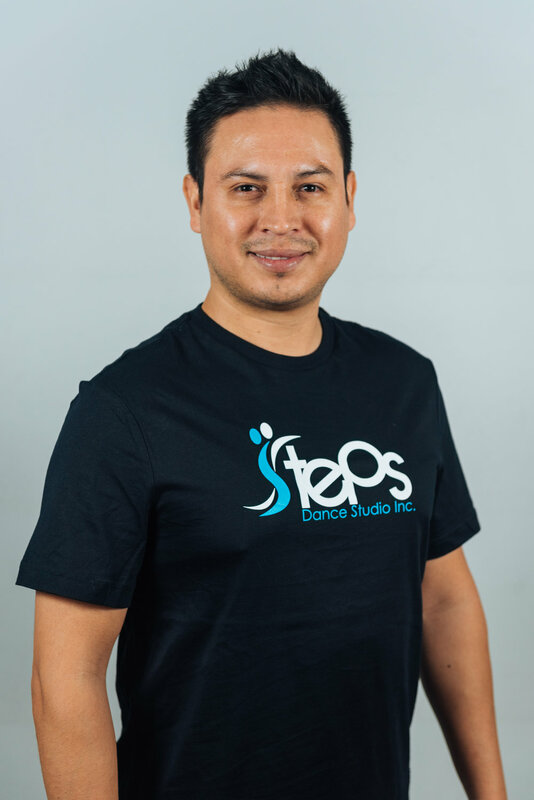 As a co-owner of Steps Dance Studio, Angelo is a full time instructor, choreographer and performer. He is currently managing all of the Steps performance teams, and is choreographing for couples as well as competitors. Angelo is a professional competitor having won the Canada Salsa and Bachata Congress as well as the Chim Pum Callao Salsa Congress in the professional Bachata division. He also coaches and competes in Pro-Am showcase and heated divisions at local and international Congresses. Angelo has trained with multiple world-renowned artists such as Tito Ortos, Tamara Livolsi, Anya Katsevman, Billy Fajardo, Katie Marlow, Nelson Flores, Adriano Ieropoli, Samantha Scali, Grupo Alafia and Raul Santiago. He has completed the Salsa Certification course with Tito Ortos in both 2017 and 2018. Angelo has taught and performed with the Steps Professional team in various Salsa Congresses and events including Mambo Nights in Bermuda, the New York Salsa Congress, Hustle & Salsa Festival in Puerto Rico, the Montreal Salsa Convention, the Canada Salsa & Bachata Congress, the International Hustle & Salsa Competition in Miami and the Ottawa Salsa Congress. His love for Latin dance is reflected in his teaching technique. He is truly passionate about sharing his knowledge and in return seeing growth and advancement in his students. Interested in joining the team? Our school is always growing!